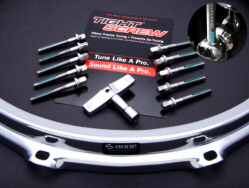 TightScrews are guaranteed to solve your de-tuning problems. S-Hoops will help you attain killer cross-stick and rim shot sounds. Now both are available together and they are an unbeatable upgrade for your kit!. Just click on the S-Hoop size you need and the combo options will appear. 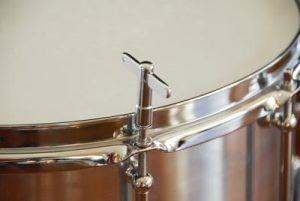 S-Hoops feature a patented “rolled down” contact surface that when struck, provide that great crack and sweet-spot feel of a perfect rimshot. The TightScrew/S-Hoop Combos are available in most hoop/hole configurations from 8 inch to 18 inch, with your choice of 42mm, 65mm, and 52mm TightScrews.